I’ve always loved plants. I like their colour, their smell and the feeling I get when I’m surrounded by them, both inside and outside the house. Last year, I started covering the entire windowsill of my bedroom with plants and experienced their benefits first-hand. I’ve noticed that since adding greenery to my space, my mood has improved and I’ve felt more relaxed. I have several potted plants in my office here at the Nature Conservancy of Canada (NCC) in Edmonton, and I find that having them in my space has a similar positive effect. It turns out I’m not the only one who feels positively influenced by the presence of plants. Research and studies have been done to discover and help reinforce the idea that these natural elements can help contribute to our overall well-being. The “How nature contributes to mental and physical health” study, published in 2004 by Jules Pretty, suggests that the presence of living things makes us happier. One of the levels of engagement with plants that he suggested was that just viewing nature in our home or office can have a positive effect on our mental health. The results of a study published in HortScience in 2005 reinforced these findings. Researchers measured the human response to people having plants in their workplace versus not having plants in their workplace. They found that participants who didn’t have an outdoor view or plants in their workspace experienced the highest degree of tension and anxiety. Plants need love and attention to thrive, but some are easier and more resilient than others. Last year I bought some new plants, and it’s been over 10 months and they’re all still green and growing! Here’s what you can find around my house. 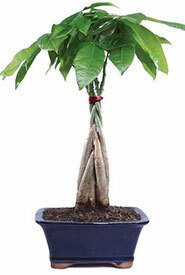 This potted plant has an unusual braided trunk and emerald green oval-shaped leaves. Some believe that this plant brings financial success, hence the name. Regardless of whether or not this plant makes you rich, it’s easy to take care of, and its presence is sure to enrich your space. Place it in a sunny area — on a windowsill or side table. Allow the plant to get quite dry before watering, and make sure any excess water can drain out of the bottom so the roots don’t rot. 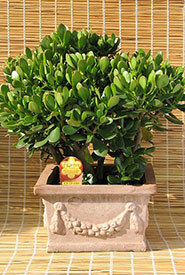 Jade plants are resilient, easy to take care of and can live for decades if well taken care of, making them a very popular houseplant. They have green, oval-shaped leaves and thick, wood-like stems. For best results, place it in an area that has at least four hours of direct sunlight a day and give it a generous amount of water ever few weeks. If the leaves begin to spot or dry up, it’s likely a sign that the plant needs more water, so just respond accordingly and the spots should disappear within a week. These plants are bright, beautiful and perfect for anyone, regardless of their past plant expertise. The only thing better than having a plant as a decoration is having a plant that you can also eat! This is why herbs, such as basil, are some of my favourite houseplants. 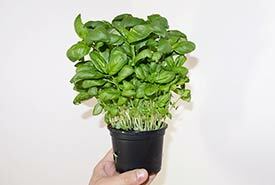 Basil has green, oval-shaped leaves that can be harvested and used for dishes like pasta and spring rolls. Basil loves sunshine, so it’s usually best to put it on a windowsill that gets a lot of sun and water it once a day. 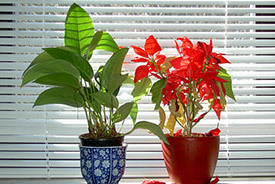 If the plant begins to wilt, just give it an extra helping of water and it should bounce back within a day or so. We all have busy lives and we don’t all have time to get outside every day, so try bringing a little bit of the outside world into your space instead. Don’t wait until the next time you’re having an off day to start decorating with greenery. Although nothing will entirely replace the benefits of getting outside in nature, potted plants can still help you relax and improve your mood when you’re stuck indoors. Jackie Bastianon was the 2018 communications intern for the Nature Conservancy of Canada in the Alberta Region. Read more about Jackie Bastianon.